‘I’m Scottish through-and-through but England asked me first,’ explained Gary Graham. 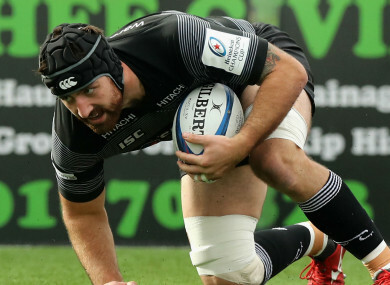 Newcastle Falcons back-row Gary Graham. UNCAPPED BACK-ROW FORWARD Gary Graham has replaced Blade Thomson in the Scotland squad for their two remaining November internationals. Thomson suffered concussion in the Scarlets’ defeat to Edinburgh on 2 November. The flanker will play no part against South Africa on Saturday and also misses the Test against Argentina. Graham, the son of former Scotland prop and forwards coach George, could win his first cap at Murrayfield this weekend after being called up to the England Six Nations squad earlier this year on residency grounds. “I’m Scottish through-and-through but England asked me first as I’m eligible through residency. It would have been a silly opportunity to pass up, as I hadn’t been selected for a Scotland squad since the U20s,” said the Newcastle Falcons flanker. “I’m absolutely delighted to get this opportunity. I phoned Gregor [Townsend, Scotland head coach] to assure him I wanted to play for Scotland, and always wanted to play for my country. Email “Scotland call up Newcastle flanker who featured in England's Six Nations squad”. Feedback on “Scotland call up Newcastle flanker who featured in England's Six Nations squad”.